Bowler Anya Shrubsole says making the England women's team a full-time professional outfit provides a "legacy" for the sport. Somerset's Shrubsole is one of 18 players to be awarded central contracts by the England and Wales Cricket Board. 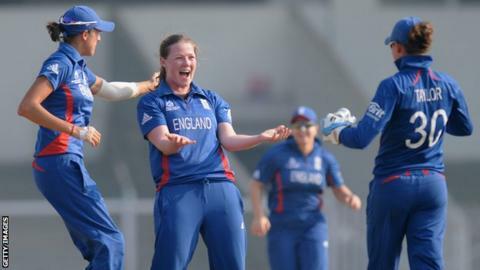 "I think it is a big step and is really exciting for women's cricket," the 22-year-old told BBC Somerset. "It means we can improve as a team and hopefully provide a legacy for the girls who come up in years to come." Charlotte Edwards, Tammy Beaumont, Natasha Farrant, Lydia Greenway, Laura Marsh (all Kent); Katherine Brunt, Danielle Hazell, Lauren Winfield (all Yorkshire); Georgia Elwiss, Sarah Taylor (Sussex); Jenny Gunn, Danielle Wyatt (Nottinghamshire); Rebecca Grundy, Amy Jones (Warwickshire); Heather Knight (Berkshire); Kathryn Cross (Lancashire); Anya Shrubsole (Somerset); Natalie Sciver (Surrey). Confirmation of the contracts follows the decision by the ECB in February to significantly re-invest in the women's game, with all 18 contracted players now set to benefit from improved funding. The move into a professional era comes after England's women won back-to-back Ashes series against Australia in 2013-14. And last month the team also reached the World Twenty20 final - with Somerset captain Shrubsole named player of the tournament for taking 13 wickets - more than any other player. The Bath-born seamer says becoming professional will allow the England team to develop further. "I don't think there will be a sudden improvement. If you look at our record as a team over the last few years, we've been hugely successful," she added. "But it allows some flexibility, to allow us more time to train, and hopefully in time it will drive the standard of the national team forward."